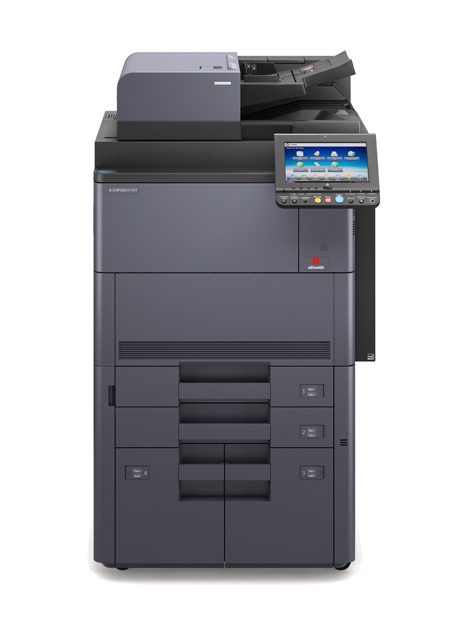 The superior performance of the digital monochrome d-Copia 7001MF and d-Copia 8001MF multifunction systems empowers large workgroups to tackle the most demanding office printing challenges. Speed, precision and productivity are just a few of the features that make these models a ‘must-have’ in businesses with large mono print volumes. The powerful 1.2 GHz Quad Core processor and 8 GB SSD (Solid State Drive) which manages the operating system allow the d-Copia 7001MF and d-Copia 8001MF to process the most demanding jobs rapidly. The JAWS software development platform allows installation of other applications on these devices, so extending possible uses and functionalities. Cloud connectors and Google Cloud Print™ support scanning and printing from Cloud archives. Printing from mobile devices is made possible with the Android and iOS-compatible Olivetti Mobile Print app and support for AirPrint® protocol enables printing from iOS devices without the need to install other software. As these systems handle large quantities of documents, data security is a very important issue. Confidentiality of data is guaranteed by the optional Data Security Kit (ISO 15408 Common Criteria) providing EAL3 security level. In addition, the Sanitisation function employs numerous overwriting actions to render impossible the recovery of data from the HDD (Hard Disk Drive), SSD (Solid State Drive) or Fax memory. Data encryption based on the AES256 algorithm (Advanced Encryption Standard) offers protection from potential hacker attacks.